Ratchet and Clank are on Marnith and something is wrong. T for violence and blood. “Ratchet, we have been on many adventures, but the clock needs someone to protect it. It is what I was built for,” he said, then reached out his hand to shake Ratchet's hand. Instead, with a sad look on his face, Ratchet bent down and hugged him. Clank was shocked, then hugged him back. “I always thought you were the sidekick,” Clank replies with his signature laugh. Alister looks confused and says, “Where are you going? This is your responsibility. You can't just walk away! The lombaxes need us!” Ratchet keeps walking and Alister gets mad. He shouts, “Don't walk away from me!” Ratchet ignores him and keeps walking. Alister is now furious and yells, “I said stop!” He then shoots electricity from his wrench at Ratchet. Ratchet turns to see what is going on. The electricity hits him square in the chest and he crouches, holding his chest. He stands up slowly, seemingly stunned. His chest is sparking. Ratchet looks like he's in pain and has a hard time breathing. He does two small coughs, then his hand slowly drops from his chest and his eyes droop. His body starts to go limp. Then he starts falling. Clank lunges for him but it is too late. He falls backwards off of the platform, smoke replacing the sparks on his chest. 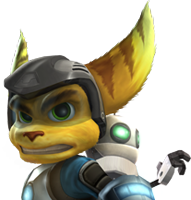 “Ratchet!” Clank cries out, watching his best, and probably first, friend fall into the nothingness of space. He knows he is dead. Clank suddenly feels empty inside. His friend was gone. What was he going to do? He then turns and looks at Alister. Alister looks angry. He sneers at Clank and shoots electricity at him. He jumps out of the way just in time and looks at Alister in horror. Ratchet jerks out of bed and grabs his wrench, shouting, “What's going on?! Who's attacking you? !” Clank comes to a stop and sighs. He was fine. “No one, Ratchet. Just one of my dreams again,” he replies. “Sorry, I will try not to next time,” Clank says. Clank walks over to him and sits where Ratchet pats next to him on the bed. “What's in those dreams that gets you so worked up?” he asks Clank. Clank thinks for a moment. Should he tell him? No, he didn't need to know. “In a little bit,” Clank replies. Ratchet nods and heads to the kitchen. Clank sits and thinks for a moment. Why didn't Ratchet remember? Then he remembered. He had gone back in time and undone that. So he was the only one that remembered. That had never happened as far as everyone else was concerned. But that had been the worst thing to go through. He even had nightmares about it, something robots usually weren't supposed to have. After collecting his thoughts he got off the bed and went to join Ratchet for breakfast.